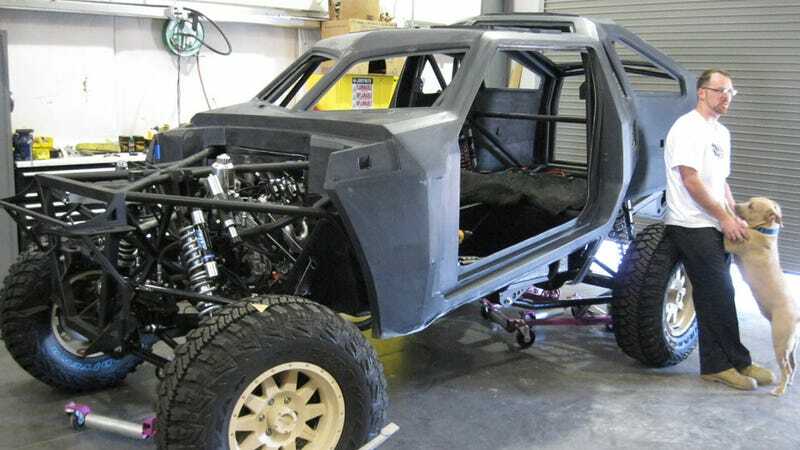 Phoenix-based Local Motors has been busy building off-road rally cars designed by crowdsourcing. Yesterday, it showed off the results of the same process applied to the idea of a military hauler. The Local Motors XC2V is being built in cooperation with the Defense Advanced Research Projects Agency (DARPA), the military's think tank for future technology. The goal was to test whether the Local Motors method could develop a combat-support vehicle from pictures to reality in a few short months, rather than the several-year process such machinery typically requires. The XC2V uses the same process pioneered by Local Motors for its Rally Fighter, the first-ever crowd-sourced "creative commons"-like car, which was the culmination of 35,000 designs by 2,900 community members from over 100 countries. Local Motors doesn't even have a designer for their cars on staff. Each major system of the vehicle - whether it's the exterior design, interior design or doors - heck, even the name - are developed in an open source development process. Once there's enough support for any single design, Local Motors will develop it openly. That means members of the Local Motors community not only choose which designs are developed, but also, they get to help develop them. Contests are held for the development and the winner receives a monetary prize based on the importance of the system to developing the overall vehicle. Thus, door design might receive less money than say, exterior design. Working with DARPA, Local Motors ran a $10,000 design competition for people to submit a vehicle body design for two different missions — "Combat Reconnaissance" and "Combat Delivery & Evacuation." After picking Victor Garcia's FLYPMODE design earlier this year, Local Motors has been documenting the build on an extensive blog, showing how the company took the outline from computer drawings to real-world vehicle in a matter of weeks. While several modifications were made along the way, the basic design — a more traditional dune-runner shape with straight-edged bodywork — remains intact. Local Motors has also opened up the shop for Phoenix residents to take a view, which is how Jalopnik commentator 57sweptside got an up-close view. As you can see, the body panels are still being bolted on, having just arrived a day earlier. Like the company's regular Rally Fighters, the XC2V uses a GM LS3 V8 in a racing tune bolted to a 4-speed automatic and Ford rear axle. While the car's tube frame is custom-designed, most of its mechanical parts are off-the-shelf. Once the build of the XC2V is completed within a few weeks, Local Motors and DARPA plan to use the car as a proof of concept and to test just how well it might withstand the rigors of hauling people and supplies quickly over hostile terrain. Given what Rally Fighters are capable of, the toughest obstacle might come from the companies who make today's military vehicles.